A touch of Bermuda is evident in this environmentally friendly 1,300-acre community built around two championship golf courses, lakes and lush tropical preserves. Sand cranes, blue herons, egrets and other wildlife dwell within the natural habitat. The condo is located 20 minutes south of Sarasota and is situated in Venice's premier golf club community (situated on the 15th hole of the Bobcat Golf Course). Located within easy access to all of Florida's attractions and only a five-minute drive to world-class beaches and islands. 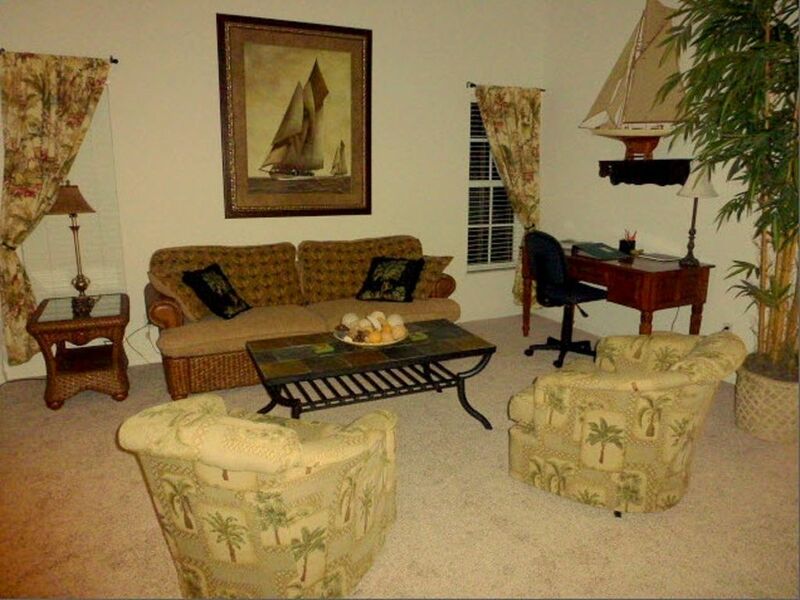 The condo has been furnished to an exceptional standard throughout and offers over 1,650 sq. ft. of fully air-conditioned comfort. It includes a fully outfitted kitchen with breakfast nook and fully equipped laundry. The great room features a spacious living area including an enclosed lanai that overlooks the lush semi-tropical settings and green fairways. Two TVs (the TV in the lanai has a combination DVD/VCR player) and many books on the area, history and regional attractions are available to guests. A heated pool is located adjacent to the condo; a heated junior Olympic pool is also available for your use at the Clubhouse, which also has a well-equipped exercise room, dining and meeting facilities, and a library. Riding a bike among the many trails and pathways, or exercising among the many walkways provides further enjoyment and opportunity to see the wildlife. President of a San Diego County international marketing communications firm; have had my own business since 1991. My wife Jan is a Broker/Realtor in San Diego County. Recently remodeled; very comfortable and quiet. Guests worldwide have enjoyed staying at the condo. We also encourage long term rentals. Ideal for people that may be building a house, relocating, etc., and require a comfortable place for 3+ months while waiting for permanent accommodation. And we will work out a mutually agreeable discount for a long-term rental. We have a social membership; no charge to use the gym and junior Olympic-size swimming pool; located about a half-mile from the condo. There is also a smaller swimming pool 30 yards from condo. Available; have a social membership with Plantation Golf & Country Club. Fee to play. Available; have a social membership with Plantation Golf & Country Club. Fee to play rounds, cost varies throughout the year. Beautiful and comfortable. Would choose again. The property is well located, short drive to beach. The pool is right across the parking lot. The owner made contact to make sure we were comfortable and if we needed anything. We were so surprised when we arrived to find a beautiful and generous welcome basket . Would definitely stay here again and highly recommend. I have to say, my stay at 803 Montose Dr in Venice FL was terrific. The unit was much larger than it appeared online. A beautiful view of palm trees and the golf course and the smaller, heated pool was a short block away. The appointments were very nicely done and there really wasn't anything I needed to bring but my clothes, flip flops and beach chair. Everything else was provided which included clean sheets, towels, everything one needs to cook or entertain. I am a widow and I felt safe and met some lovely neighbors. I would definitely recommend this unit to anyone. Jill - We're glad you enjoyed your stay and look forward to having you as our guests again. And thanks for such a great review! very beautiful home , clean and convenient, very friendly owner, thanks! Very beautifully home, clean and convenient, very friendly owner, thanks! The owner was very responsive to all our needs! We really enjoyed our stay at Plantation Country Club. Thank you!! !